Apoptosis is a physiological mode of cell death in which cells are removed or eliminated from the body in response to a given signal or stimulus (1). Apoptosis, also known as programmed cell death, can be distinguished from accidental cell death, referred to as necrosis, by a unique set of characteristics that includes cell shrinkage, nuclear condensation, internucleosomal DNA cleavage, and apoptotic body formation (2). Although many studies have focused on the biochemical (i.e., internucleosomal DNA cleavage) and morphological (i.e., apoptotic body formation) characteristics of apoptosis, relatively few have examined the characteristic cell shrinkage associated with programmed cell death. 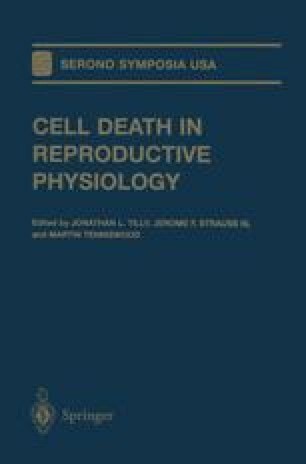 The distinctive feature of volume loss during this form of cell death was observed from the very first reports of apoptosis (3, 4), and subsequently, cell shrinkage has been observed in all well-defined examples of apoptosis. Thus, the loss of cell volume, along with internucleosomal DNA cleavage, reflects key components of the programmed cell death process.